There are many compilers available for C language for different platforms, of which Turbo C is the one used commonly for Windows operating systems. You may all know that Turbo C/C++ is a 16 bit compiler which was originally developed for Windows versions up to XP. 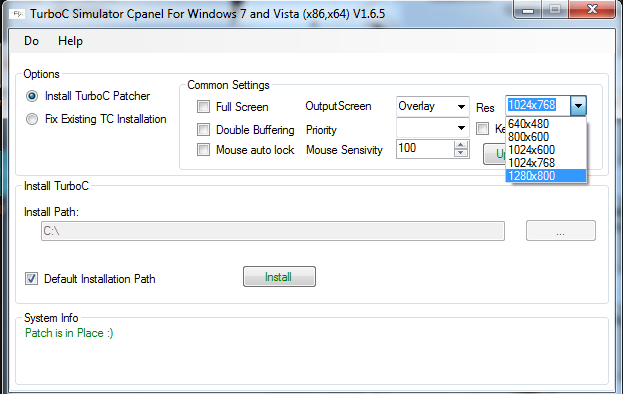 Nowadays most people uses latest versions of Windows like Vista and Windows 7. The primary reason behind this shift in usage of operating systems is “stability”! Windows XP is an unstable operating system where as Windows 7 is much better and can be considered as a stable operating system (when used for personal computing requirements). Now the problem is Windows 7 comes in 32 bit and 64 bit versions only. You can’t easily run a 16 bit compiler in a 32 bit/64 bit operating system. Don’t expect compiler to work with direct installation as you might have already done in Windows Xp. But no worries! There are many tricks/tweaks which can make the compiler work in any versions of Windows – may it be 7/Vista – 32 bit/64 bit – it doesn’t matter. Out of the many tricks available, I found this as the most easy way to setup Turbo C compiler for your Windows operating system. You just need to download this simulator and install it as per guidelines. The biggest advantage is that this simulator will work perfectly on any Windows OS (XP, Vista and 7) irrespective of 32 bit/ 64 bit versions. Installation can be considered as a two step process. First you may install the .exe file you have just downloaded. This will take you through some steps and finally you will get an icon on your desktop named – “Turbo C Simulator Control Panel“. If you have not got such an icon on desktop, then you may try searching in your “start up” of desktop, you will definitely find a program named “Turbo C Simulator Control Panel”. Now you may right click this icon and select “Run as administrator”. This is really important. If you are trying to install without running as administrator, your installation will fail. When you have done this, you will see a dialog box like the screen-shots shown below. Step 1:- As shown in the screen shot, select the “Advanced Screen” option. Step 2:- You can select many options here. The most important thing is resolution of your desktop. Select same resolution as your desktop is set. Uncheck the options you don’t want! 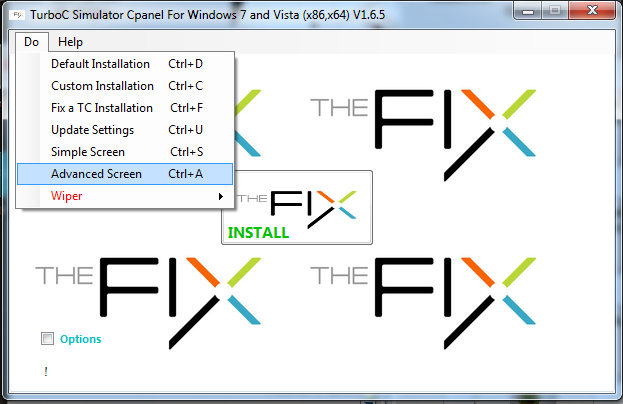 You can also select the installation directory. I recommend to leave it as “default”. If you go other way, please do remember path of your installation. Finally click “Install”. Final Output:- Finally you will see a success message as shown in the screen shot below. A new icon named “Turbo C FIXED” will also be there in your desktop. One of the major issues that come across while setting up Turbo C is – misplacing directory paths. Refer the screen shot below to correctly configure directories of Turbo C/C++. The main part to take care of is the TC directory and where it is located. The location/path of TC must be specified correctly here. As I have wrote at the beginning of this article, there are other methods available for setting up Turbo C/C++ compiler on your Windows 7. The one I wrote is the easiest one. You still can check out other options. Refer the links below. You can also check out this article from IndiaExam.in website. I think they also use the same DOSbox concept but I think they have made the installation process much simpler. I haven’t tested their version yet! So I am not sure it will work perfectly or not. You may try and comment your opinion here. sir,i could not able to find turbo c. please help me sir. Integer and float values are not populating correctly.. Any one can help? i am not able to find turbo c set up please send me it is urgent . sir i am unable to intall turbo c .please send turbo c setup its urgent. worthy post . It really helped me a lot..
sir i am unable to intall turbo c .please send turbo c setu its urgent. Thank you. After two and a half hours of pulling my hair out, your post is a Godsend. I will definitely recommend it to others. thank you so much yar to leave C’& web. A.o.A. i am very happy to read you instructions and i have solved my problem. i am searching for this from 4 days and today i am find this. thanks yar for leave c’& website..
Its work wonderfully.. Thank you a lot. 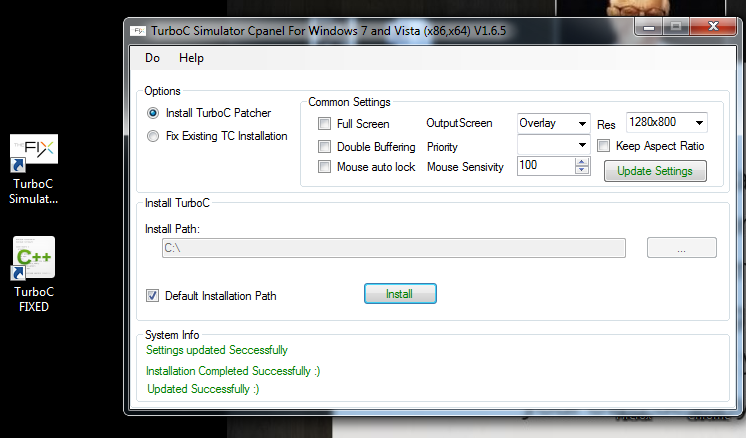 The process of installation TCC through stimulator is awesome. thank u so much dude.. It works just perfect…. How to run only C programs on the simulator.